The face of the music industry is changing, and it’s pretty exciting. An industry once almost exclusively comprised of (and controlled by) rich white men is slowly but surely transforming with regards to race, gender, and age. The opinions of older music executives are being challenged daily by new rising leaders in music; the age-old practices and traditions are being deconstructed and reimagined by fresh minds. More Black and Brown faces are pulling seats up to the table and changing the way that the game is played; more female voices are breaking the silence and using their power to level the playing field. In honor of Women’s History Month, here are a few of my favorite young women of color who have committed themselves to shattering glass ceilings and shaking up the music industry through the work that they do. Cristina Jerome is the queen of the underground. Hailing from Norfolk, Virginia, Cristina currently resides in Broward County, Florida, doubling as a journalist and event coordinator, with music being her main area of focus. It’s been a long time coming for Cristina; from starting her own internet radio station in college, to running an underground rap blog (Da Decipher), to now providing underground artists with entertainment services, Cristina understands that artists need more than just the spotlight—they need development and career assets. Currently, Cristina is one of the one of the only people pushing R&B and alternative music in Miami’s music scene, but she hopes to see more inclusion, greater visibility of “the little people,” and an increase in genre-bending. As the founder of RnBae Collective and a firm believer in building your own tables when you can’t find a seat at another one, Cristina curates her platform and events for those very purposes: she utilizes her authority in the music scene to bring to the forefront the new kids on the block. From a DSLR camera in 2010 to Cinematic Music Group in 2019, Brittney Briggs is constantly climbing the ranks. Growing up in South Orange, New Jersey, Brittney found herself frequently surrounded by people who made music, and with her newly purchased camera, she volunteered to shoot their music videos. This minor decision acted as a major catalyst for her eventual success—she now boasts the titles of film director and creative director of her own creative agency/film production company, Common Courtesy, as well as editor at Cinematic Music Group. At this point in her career, in addition to continuing to unapologetically occupy space within the music industry, another one of Brittney’s priorities is to continue to make herself and her work known to show other women of color that is, in fact, possible to be great. Though it can be difficult navigate through a male-dominated industry, Brittney’s commitment to moving forward and creating high-quality content will always separate her from the pack. “It’s not about me. It’s about you and your story being told.” As a manager to BRAX and Ninety Four and founder of entertainment agency “WASPOPPIN,” Harlem-native Sydney Vann is often the first face that people see, but her goal is to make sure that your voice is the first one that people hear. Inspired by Lauryn Hill’s soul-revealing and storytelling album “Miseducation of Lauryn Hill,” Sydney’s ultimate goal is to tell stories through the avenues of brand development, marketing strategy, content curation, and management. Sydney’s dedication to amplifying the voices of those around her is unmatched, as she firmly roots herself in the mantra that creators should have more power over their stories. Sydney is far from finished, as her long-term goal is to transform her current platform into a multimillion dollar channel, providing storytelling of all creatives in all facets of content, brand identity, and music creation. As she moves towards this goal, Sydney understands the importance of collaborating horizontally, working with people within her age demographic, because she believes deeply in the power of our generation. Jersey-native Nadirah Simmons is a woman for women. As a natural-born storyteller and the founder of media platform and Hip-Hop social club “The Gumbo,” Nadirah’s goal is to highlight women in the industry, while prioritizing the voices of Black, Brown, and LGBTQ+ women. Nadirah notes that the music industry can be difficult for women of color as a result of lack of access, exposure, and funding. However, by exposing audiences and extending paid opportunities to women, Nadirah’s role in the music industry is a wonderful example of what it means to advocate for your own people in the midst of marginalization. 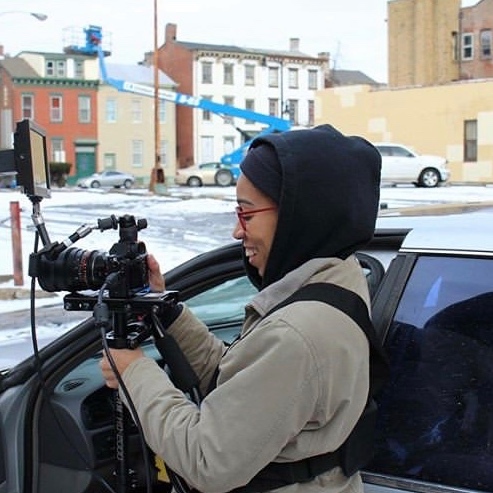 With connections to television via her role as the associate producer of social media at “The Late Show with Stephen Colbert,” Nadirah plans to bring The Gumbo onto larger platforms—television spaces, festival spaces, and event spaces—which would inevitably provide the women for which she advocates with greater opportunities to showcase themselves and their work. The preservation of Hip-Hop culture is the name of the game for Tanasia Smith. Growing up in the heart of Harlem, one could say that Tanasia fell in love with Hip-Hop early on. This love slowly but surely bloomed into a passion as Tanasia got older and began to frequently attend “106 & Park” filmings and CD signings throughout the city. Now, as the co-creator and co-producer of “Get Hip: The Hip-Hop Game Show,” Tanasia is using her mind and resources to pour back into the culture that raised her. Through Get Hip, Tanasia aims to provide the masses with vital music history information while providing a platform to up-and-coming creatives who share the same passion for Hip-Hop as she does. Get Hip is only the beginning for Tanasia, as she plans to eventually break into radio and leverage her position to make room for younger talent. She intends on being the change she wants to see in the music industry by turning her current (and future) platform into a place where the youth are welcome to showcase their talents and knowledge. From singing in the church choir to opening up for Eminem in front of tens of thousands of fans, “don’t nobody do it like Shaé Shaé.” London based singer-songwriter Shaé Universe aspires to be recognized as a symbol of excellence, and she is well on her way. The combination of her unique voice and her extensive vocal range hasproven to be a killer, capturing the hearts of anyone under the sound of her voice. With cosigns from artists such as Etta Bond, Kojey Radical, and Boogie, Shaé has created a lane for herself as a conscious R&B artist whose music soothes the ears while nurturing the soul. Though she notes that men in places of higher positional power within the music industry often try to exploit her gifts as a Black female artist, Shaé remains steadfast in her belief that her success will be her solution and continues to advocate for the visibility of Black women in music. By making a conscious effort to represent herself truthfully, she believes that she can create authentic spaces for other women of color to sit at the table. Goldie Harris is, by definition, the Jill-of-all-trades. She is a multi-media producer, marketer, event producer, and beer brewer who is currently pursuing a Master’s Degree at The New School. Goldie had a relatively early start to her music career, directing and shooting music videos for local artists in Elmont (Long Island) as a high schooler. Though she always had a passion for bringing music to life through visuals, she did not truly come to realize that music was her calling until her junior year of college, when she executive produced her college’s spring fest: after two years of booking and selling out shows in record time, Goldie decided that her new goal was to influence and create a platform for music, media, and art while simultaneously bridging the gap between culture and community. Excited by the emerging dominant female faces in the industry, Goldie hopes to contribute to this positive trend by continuing to give women the platform to create and be heard. Her support for women of color can be seen in everything she does—a prime example is her 24:OURS Creative Studios, catering to a clientele comprised of 60% Black women, including SVGE Magazine.